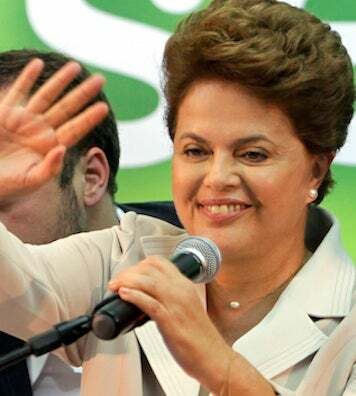 Dilma Rousseff was elected Brazil's first female president yesterday. She said in her victory speech that she wanted "fathers and mothers to look their daughters in the eyes and say, 'Yes, a woman can.'" Perhaps it would be more accurate in this case to say, "She can, with the most powerful man in Brazil backing her," in this case term-limited president Lula, for whom Rousseff served as chief of staff and energy minister. Just about every man/woman on the street interview yielded a mention that the voter hoped it would mean another term for the wildly popular Lula. (In the AP: "If Lula ran for president 10 times, I would vote for him 10 times...I'm voting for Dilma, of course, but the truth is it will still be Lula who will lead us.") Rousseff has never run for office and just about every story about her refers to her lack of charisma, despite a dramatic past as a guerrilla fighting Brazil's dictatorship. Then again, like many of Latin America's female presidents, Rousseff wasn't married to her patron — she achieved her position through being a solid manager and technocrat. (And of course, loyalty). Michelle Bachelet, who recently vacated the presidency of Chile, is an exception on this front. Neighboring Argentina has a female president, Cristina Fernandez de Kirchner, who took over from her husband Nestor Kirchner (who died last week); decades earlier in the same country, Juan Peron passed the torch to his wife Isabel, a weak president who was overtaken by a military coup and subsequent bloody dictatorship. The president of Panama until 2004, Mireya Moscoso, was the widow of the three-time president. For all the talk of her lack of charisma, if Rousseff delivers results — steering the country at a crucial time, its currency booming, about to host the World Cup and the Olympics, in possession of newly-discovered oil reserves — she could come out from Lula's shadow. Or he could run again in 2014. Either way.